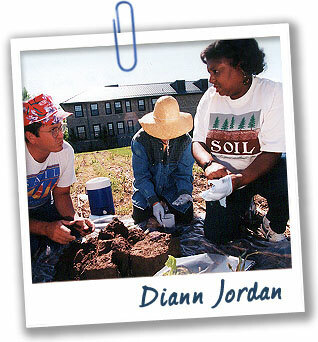 Diann Jordan studies ecology and microbiology. She is also the author of Sisters in Science: Conversations with Black Women Scientists on Race, Gender, and Their Passion for Science. Is soil a part of your childhood memories? I grew up on a farm with my grandparents. Soil was a natural part of my life. When I was nine, my mother recognized I was a curious kid. She bought me a pair of magnifying binoculars, and I would go around the farm chasing bees, picking flowers, and collecting plants. How did you get interested in soil science? My grandparents understood that the soil has life. They loved the land, and I loved it because they loved it. But I didn’t have a clue growing up that there was a discipline (or career) called soil science. Fortunately I had an excellent teacher at Alabama A & M University. He made soils come alive! A few years ago I got very interested in working with earthworms, and now my favorite soil is one where I can find worms!